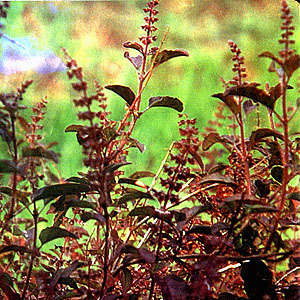 Balanoy – Scientific name: Ocimum basilicum L.
A very fragrant herb, growing up to 70 cm high. An erect, branched undershrub, glabrous or somewhat branched; very aromatic when crushed. The stem is squarish. Leaves: simple, opposite, ovate to oblong-ovate, entire or slightly toothed, with acute tips and glandular spots on the lower surface. Flowers: the inflorescences are racemes, usually purplish with short pedicles. Calyx of the individual flower or floret is strongly reflexed, the upper lobe round, the lower two narrowly lanceolate and acuminate, and the lateral ones ovate. Corolla bilabiate, exerted, and upper lip broader, subequally 4-fid, the lower lip entire. Petals pink or purplish, stamens exserted.Fruits: nutlets, smooth or somewhat rugose. There are two common species in the Philippines: O. basilicum and O. sanctum. Both can be used medicinally. Tannins; polysaccharides; saponins; flavanoids; volatile oil. Carminative, stimulant, diaphoretic, expectorant, febrifuge, diuretic, demulcent, mucilaginous, cooling. Grows well in open areas with moist, well-drained and friable soil. Occasionally cultivated throughout the Philippines. Common garden plant. It flowers all year round. The plant is deeply rooted. Prefers warm and moist habitat, sensitive to dryness. Soil should be well-drained, and rich in humus to produce higher yields. Use seeds for propagation. Mature fresh leaves are harvested 2 to 3 months after planting. Leaves are picked leaving the branches on the plant to allow it to flower and produce seeds for the next season. The leaves are air-dried until they crumble when crushed with the fingers. Store in amber colored bottles in a cool, dry place. The leafy and flowering tops are used as condiment; eaten sparingly in salads. Cough: Expectorant properties – Take infusion or decoction of herb (9-15 gm of dried herb) or tops as tea. Leaf juice helpful for expectoration of mucus. Decoction of leaves also used for hiccups, vomiting and nausea. Gas pains: Decoction of herb as tea helps to expel wind from bowels. Snake bites: Crush fresh plant and poultice the bitten wound. Gonorrhea, using a decoction of the roots and leaves of plants. Decoction of leaves used as a wash for ulcers. Used in baths for rheumatic pains. Ringworm and insect bites: Apply juice of crushed leaves. Skin ulcers: Decoction of herb as wash.
For delayed menstruation: take the juice of the leaves with water. Seeds are used in treatment of several eye diseases. Toothache: Wet small piece of cotton with juice of crushed leaves and insert into tooth cavity. Postpartum: Decoction of seeds used to decrease postpartum pains; the seeds are mucilaginous. Poultice of seeds used for buccal sores. Decoction of seeds also used for constipation. Acne: Infusion of 3 tsp of dried leaves in 1 cup of boiling water for 20-30 minutes. Apply externally or drink decoction of tea or infusion 3 times daily. This entry was posted in List of Medicinal Plants in the Philippines and tagged balanoy on March 8, 2009 by Pinoy Herbs.